What happened in the interim? The answer is obvious: the advent of Donald Trump….Michael Barber and Jeremy C. Pope, political scientists at Brigham Young University, reported in their recent paper “Does Party Trump Ideology? Disentangling Party and Ideology in America,” that many Republican voters are malleable to the point of innocence. As these quotes make clear, the issue here isn’t religion per se, but Republican affiliation. An awful lot of Republicans apparently have very weak views on most subjects and are willing to support whatever Trump supports. 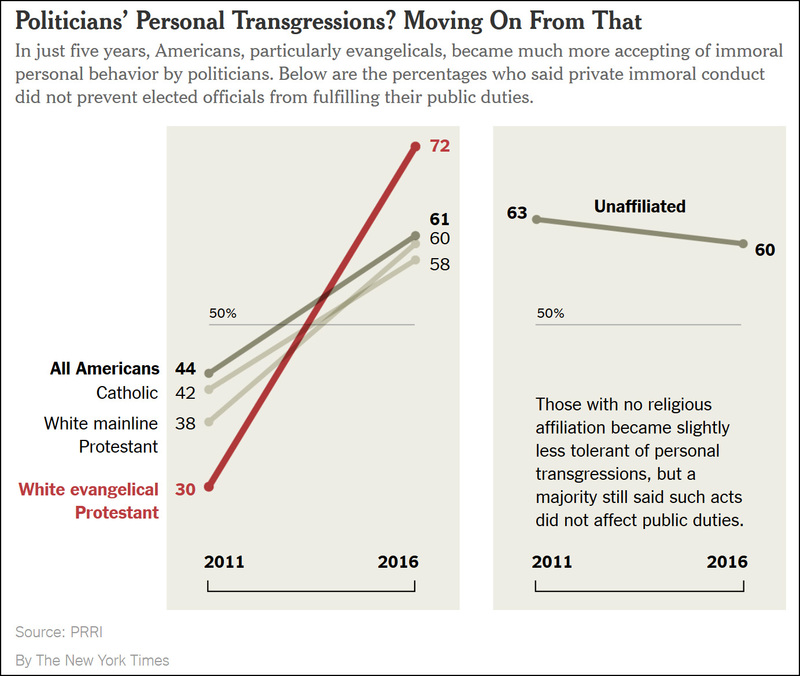 Conversely, those with no religious affiliation, who are heavily Democratic, changed their views hardly at all. That’s not to say they’re unaffected by tribalism, but apparently they’re affected a lot less. The Post apologized almost instantly, but this nonetheless became legendary on the right as shorthand for the contempt that Beltway elites feel toward evangelicals. But maybe the Post should have held its ground after all. In the age of Trump, it seems like maybe it’s evangelicals who ought to be the ones apologizing. Compared to other religious traditions, evangelicals in general really are poorer, less educated, and easier to command.